Where to begin? : It’s been a tough 15 months at the UAE helm for Zaccheroni. Friday’s result, however, was a personal triumph for the ex-AC Milan, Juventus and Japan supremo. Another host of changes, and switch of shape, produced the greatest result of the Italian’s tenure. Plus, the best performance – no matter Australia’s defining profligacy as they became the second-successive champions eliminated by the Whites at the quarter-final stage. Cutting loose sloppy centre midfielder Amer Abdulrahman was key to an improved fluidity, while the outstanding Majed Hassan’s tenacity sped up a team slowed down by the banned Khamis Esmail. Repeat the formula in the semi final and a repeat of 1996’s run to the showpiece on home soil could occur. After that, Zaccheroni’s tournament victory with Samurai Blue in 2011 shows he knows how to get a team over the line in Asia. And who would have said that in August after a goalless friendly with minnows Andorra? The way forward: Socceroos supremo Graham Arnold has been at pains to repeat the mantra that this spell in the UAE was just the first steps on a path to World Cup 2022. From the embers of this loss, a brighter future should be revealed. Degenek, at 24-years old, will learn from awful mistakes versus Syria and the UAE after playing zero minutes at World Cup 2018. He’s too good not to succeed, long term. Elsewhere, youthful wingers Chris Ikonomidis (one goal, four assists) and Awer Mabil (two goals) are emergent stars. At the other end of the scale, toothless striker Jamie Maclaren and jaded winger Robbie Kruse should have shown they’ve reached the end of their Socceroos journeys. Walking wounded: More than 10 minutes of injury time tells its own story. The UAE were walking wounded at the end, with the remaining players heroically manning the barricades. Once Zaccheroni steps back and analyses Friday’s display, he’ll note an emerging crisis in defence. Right-back Mohamed Ahmed looked to have become the second-successive player to suffer a serious injury, after centre-back Khalifa Mubarak versus Kyrgyzstan. Stand-in Fares Juma also had to get treatment several times and could barely stand up in the final throes. Right-back/winger Bandar Al Ahbabi was then revealed to have suffered a physical problem in Zaccheroni’s post-match press conference. It is a good job 20-year-old Al Jazira prospect Khalifa Al Hammadi exhibits composure beyond his years and 33-year-old Shabab Al Ahli Dubai Club utility man Walid Abbas remains utterly dependable. Wayward and homeward bound: It is a staggering statistic. The Socceroos produced 22 attempts on Khalid Essa’s goal and only two of them were on target (9.1 per cent). For all the UAE’s redoubtable defending and even Degenek’s moment of madness, this was the evening’s defining number. The void remains up top that 50-goal record-scorer Tim Cahill once filled. Worryingly for Arnold, there are no genuine candidates to fill it in the near future. A third goalless display from five matches tells its own story. FULL TIME | Our #AsianCup2019 campaign comes to an end. 21st min CHANCE: Tireless midfielder Hassan races forward from a counter-attack and slips in Ismail Al Hammadi. The winger ties Degenek in knots, but his shot is disappointingly tame. 40th min CHANCE: Striker Apostolos Giannou bursts past centre-back Ismail Ahmed and produces a strong save from Khalid Essa. 45th+ 1 min CHANCE: An Ismail Matar free-kick from out wide is flicked on by substitute Khalifa Al Hammadi. Striker Ali Mabkhout rises highest close to goal, but can only head over to produce gasps from the partisan Hazza stands. 49th min CHANCE: Giannou looks to have earned a yard of space in the penalty box. His rasping effort is bravely blocked by the excellent Hassan. 63rd min OFFSIDE: Giannou latches onto substitute Mathew Leckie’s header and slots home. These celebrations, however, are cut short when Leckie is, narrowly, ruled offside. 69th min GOAL: Degenek will not want to watch this one again. He cries foul under pressure from substitute Mohamed Abdulrahman, whose watched on by injured superstar brother Omar. Then his rushed, no-look back-pass is intercepted by the grateful Mabkhout. He rounds Mathew Ryan and slots in to an open goal. Cue bedlam. All change: Both head coaches were bold enough to change their approaches after unsatisfactory round-of-16 ties. UAE supremo Zaccheroni made five alterations from the 3-2 extra-time victory against Kyrgyzstan, with only Khalifa Mubarak (injury) and Esmail (suspension) forced upon him, and moved to a 4-2-3-1 from a 4-3-3. It was only a pair of changes for Arnold after the goalless draw with Uzbekistan, influential playmaker Tom Rogic being banned and Kruse, staggeringly, coming in for Mabil. But the Socceroos’ shape changed wildly from a 4-2-3-1, to a rare 4-2-2-2. 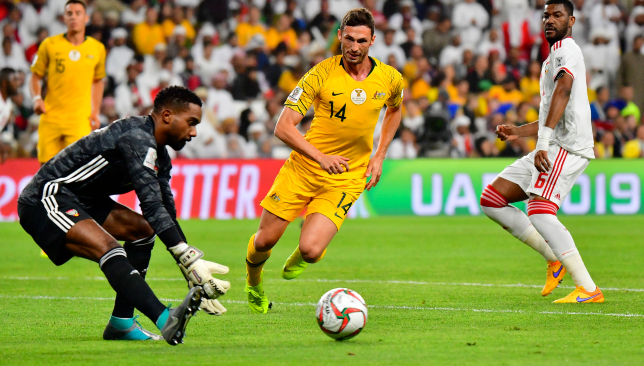 Australia struggled to effectively build-up play from deep because of the gaps between their lines, while an energy infused UAE delivered the best 90 minutes of Zaccheroni’s troubled 15-month tenure. The Whites made their own luck against the superior Socceroos. Mabkhout snaffled the game’s best chance and Ismail Ahmed was the best defender on the pitch. Onwards to the last four. The statistics point towards a heavy Socceroos win. Reality, however, was somewhat different. They critically erred in defence and attack. Arnold has much work to do during this “four-year cycle” he’s so quick to speak about. Yahya Al Ghassani has certainly taken advantage of new eligibility rules inserted this season to shine on the Arabian Gulf League stage in 2018/19. 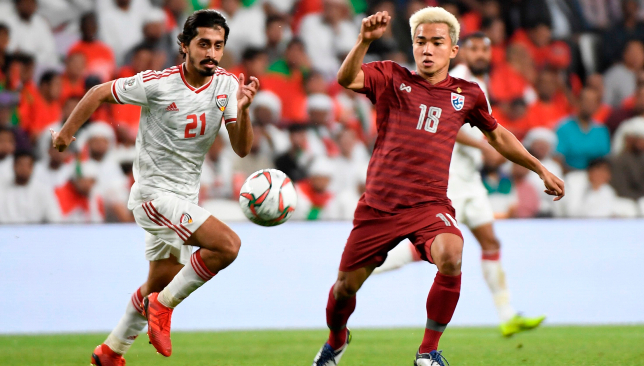 The tricky Al Wahda forward has been a standout member of the group allowed to feature in the AGL this term after November 2017’s decision by UAE President His Highness Sheikh Khalifa bin Zayed Al Nahyan that children of Emirati women born to foreign fathers will be able to compete in official UAE competitions for the first time. The 20-year-old, of Tanzanian descent, was rewarded with a bumper contract extension until 2023 at the Clarets last September, less than two months since his recruitment courtesy of the game-changing new eligibility rules. The electric forward came off the substitutes’ bench to score on his top-flight debut in the opening day 6-2 thrashing of promoted Ittihad Kalba. Such exciting ability saw the Clarets announce fresh terms. Arabian Gulf League title challengers Al Jazira are set to announce rising UAE star Khalfan Mubarak has inked a new contract, disappointing suitors such as champions Al Ain who hoped to swoop him up on a free this summer. Mubarak, 23, moved within the last six months of his current deal in January. This gave hope to teams across the top flight that they could snaffle, for a bargain arrangement, one of the Whites’ best performers at Asian Cup 2019 and the top flight’s current leading assist maker with 10 recorded in 13 run-outs. Pictures, however, emerged on social media late on Tuesday that the former Al Ahli youth player had put pen to paper on fresh terms. Sources at the Pride of Abu Dhabi expected a multi-year arrangement to be officially revealed in the coming days. The diminutive playmaker started all three Group A matches for the hosts at the ongoing continental tournament. He was brought off early on during the disappointing 1-1 draw with Bahrain on January 5’s opening night, but produced a stunning solo goal to open the scoring last week in the 2-0 victory against India. A facial injury picked up in that clash threatened his participation on Monday against Thailand. Mubarak, however, performed well in 84 minutes on the park prior to veteran Ismail Matar’s introduction to the fray in a 1-1 draw which helped secure top spot. Mubarak was tipped as a successor to Omar Abdulrahman – the compatriot whose serious knee injury in October granted him access to the UAE’s XI for the Asian Cup – by then Ahli boss Quique Sanchez Flores in March 2013. But after making just one appearance for that club as an 18-year-old, he defected to the capital with Jazira. At Mohammed bin Zayed Stadium, he’s won the 2015/16 President’s Cup and 2016/17 Arabian Gulf League. In total, he’s scored 15 times in 79 top-flight games.